This is my final morning blog post until December, and today is Samhain (also known as Halloween to many of you). It is a time when the boundaries thin and communication between living and dead is opened. It is a time to reflect on those who have passed on and think about the year ahead. Continue to finalize your harvest, celebrate your friends and push those things that were negative in your past year underneath the earth, to be cleansed by the Mother. Trick or treat is a time-honored tradition in the US and I usually get college kids from the local Christian college. I love my trick-or-treaters and always get candy to give to them. Seeing their inventive and thrown-together costumes always makes me smile. It will be colder tonight, although we don't have snow yet, so I won't have the 50+ that I had last year when it was very mild and warm, but I know I'll have some coming to my porch and I welcome them. I hope that your celebration of the holiday, however you choose to honor it, brings you joy. Current Location: Focused on errands to do and celebrations ahead. I drew a gift rune for you: Perthro, which speaks of making choices, directing your wyrd. Apply it as seems appropriate. 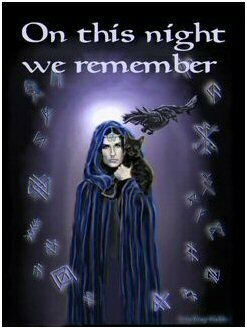 Blessed Samhain and strength through the dark months. Thanks. Three of my interlibrary loan books for my novel came in today so I'm head deep in research again :-) Ain't it grand? 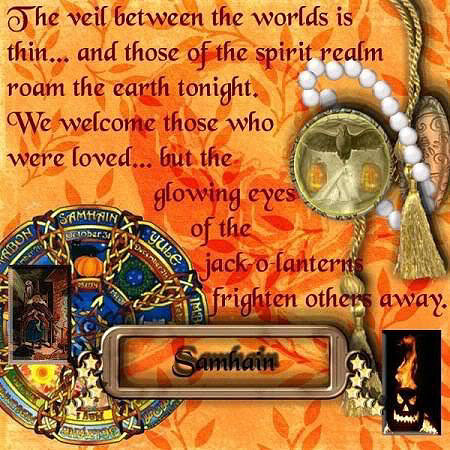 Samhain (and NaNo Eve) wishes to you! And to you my good friend. The best of this season going out to you in somewhat sunny Cali. Oh yes. Great fodder for a Halloween horror movie. The image was used in the OZ books and I always thought it was a bit spooky. I love the next to the bottom picture. It is indeed the last night and the curtain between worlds is shredded for a while. 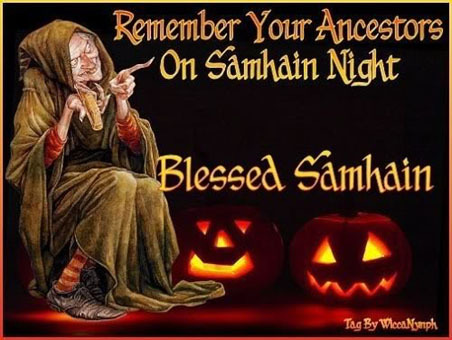 Be safe, be careful, and enjoy your Samhain. I am so very excited for you. You've done a lot to get ready for this adventure, and I'm sure it will pay off. Be sure to post or email if there is anything you need during the next 30. My Muse is surely cheering you on. I'm not sure if you can use it, but it might be fun. Thank you my dear friend. Just knowing I have you in my corner means more to me than I can ever truly tell you. I downloaded the software. It might be quite interesting. I'll take a closer look at it tonight. Don't want to spend time learning things when I'm trying to maximize production. I was at the library today making sure that my laptop was acceptable to their wi-fi and found a few books to help me. Then, as I was checking out, their software told me that three of my interlibrary loan books had arrived so I got those too. I'm thrilled with the three that came it. I really needed them! Have a good day - and enjoy NaNo! When my boy Gabriel Uffern Cwwnan (Ryel to his friends) came home he demanded wings. He's not wearing them in this photo, but I think you can figure out what he is. He sends ya his thoughts and best wishes, along with mine, and success with NaNo. 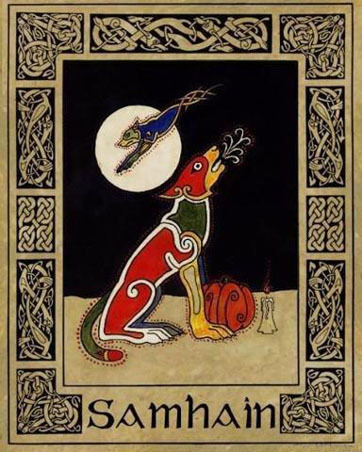 Good Samhain to you. Be safe, be happy. Have a good day and the very best wishes for NaNo!